We've been busy picking coffee for this years harvest! We are so excited to share with you that our first batch has been roasted and is for sale! Our beans are looking beautiful and most importantly tasting phenominal! I need some FRESH ROASTED COFFEE! Please note, we are making changes to our website. Currently, this address works for you to place orders. Mahalo for your patience! NEW Fresh Roast is ready for pick up or shipment! This is a VERY special crop, the 2018 harvest will definitely be a memorable cup to savor when you wake in the morning! Grab your coffee while it's here so you can sip the aroma of aloha! E komo mai, welcome to Kona Raintree Farms! 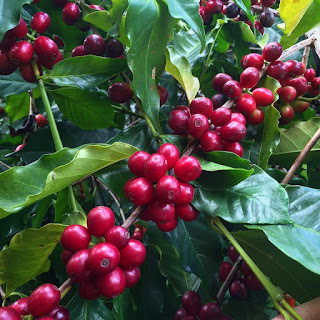 Kona Raintree Farms has 800 trees that produce high quality coffee through the months of July-December. Our cherries are hand-picked so only the ripest and most favorable beans make it through the pulping and milling stages. Once the beans have dried into parchment, they are taken a few miles south to be milled and roasted to perfection. We roast and sell in small batches to ensure that you can savor the freshest roast possible. Hot or cold there's always a good reason to brew a fresh cup.